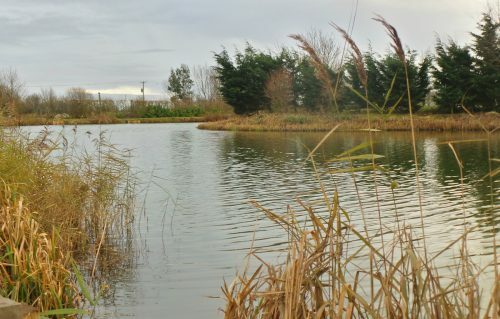 Trev’s Lake is a 36 peg oval shaped lake with a large island, specifically designed for anglers who like to use conventional float and feeder tactics as well as the pole. The stock in this lake is very versatile compared to Snake Lake, with Chub to 5lb, Bream to 5lb, Barbel to 3lb PLUS F1’s, Roach, Perch, Gudgeon, Tench, Crucians and not forgetting the big head of carp which go to double figures. In winter 2017 over 200lb of fresh stock of carps and bream were put in. Fish Corn, small cubes of luncheon meat and 6mm soft pellet fished in the margins over 1 or 2 small balls of fishmeal based carp groundbait or micro pellet. Feed micro pellet regularly to catch small Tench, Barbel,mirror and crucian carp, and bonus bream to 4lb. Size 16 hook to .14 diameter line for best results. To catch chub and barbel and odd carp fish chop worm and caster on pole line or small maggot feeder/ small groundbait feeder to the island. Once again fish a size 16 hook for maggot hook bait or a size 14 with a worm. Line diameter of .14 should be all that’s needed. Feed 3 or 4mm pellets and fish 6 to 11mm soft pellets down the middle for larger fish. Feed small cubes of luncheon meat or corn in margins, fish single or double corn or 8 to 10mm cubes of luncheon to pick out one or two better sized fish. Remember to feed little and often to keep the fish interested. As weather warms up look to catch mid water towards far edge on pellet, maggot or caster feeding regularly with a catapult.